I recently shared with our families at Hope Baptist Church how important thankfulness is in our lives. We receive hundreds of emails and phone calls a month from people asking for help through Hope Biblical Counseling Center. Almost all of the people have very serious issues and are in destruction mode in their lives. There are many factors to the destruction people do in their lives and to others around them. However, one very important issue is not learning how to use the tools God has given them or knowing the tools and not using them. Here in the Biblical Counseling Center we teach people Biblical tools and how to use them. One of those tools is thankfulness. Most of the people we counsel have never learned how to be thankful people. They are not thankful people even though they might think they are. One of the areas Satan seeks to deceive people is in the area of thankfulness and praise. More than 100 times in the Bible God tells us to be thankful people and praise Him. So, how do I do that? Psalms 100:4, Enter into his gates with thanksgiving, and into his courts with praise: be thankful unto him, and bless his name. I Thessalonians 5:18, In every thing give thanks: for this is the will of God in Christ Jesus concerning you. So many times we do not get our prayers answered because we do not give thanks. How important is this? Very! I am convinced that one of the problems with children growing up to walk with God is because they have never been taught to be thankful people or how to do so. Philippians 4:4-9, Rejoice in the Lord alway: and again I say, Rejoice. (5) Let your moderation be known unto all men. The Lord is at hand. (6) Be careful for nothing; but in every thing by prayer and supplication with thanksgiving let your requests be made known unto God. (7) And the peace of God, which passeth all understanding, shall keep your hearts and minds through Christ Jesus. (8) Finally, brethren, whatsoever things are true, whatsoever things are honest, whatsoever things are just, whatsoever things are pure, whatsoever things are lovely, whatsoever things are of good report; if there be any virtue, and if there be any praise, think on these things. (9) Those things, which ye have both learned, and received, and heard, and seen in me, do: and the God of peace shall be with you. Did you notice in verse 4, Rejoice in the Lord alway: and again I say, Rejoice? Is this your life? Be honest about that. Maybe you really know it is not and you know something is missing. What is missing is thanksgiving and praise! You must learn the submission principle. James 4:7, Submit yourselves therefore to God. Resist the devil, and he will flee from you. The devil every day, multiple times a day, will put outside pressure on your life. He does this many times with our lusts. Romans 6:12-19, Let not sin therefore reign in your mortal body, that ye should obey it in the lusts thereof. Neither yield (submit) ye your members as instruments of unrighteousness unto sin: but yield (submit) yourselves unto God, as those that are alive from the dead, and your members as instruments of righteousness unto God. For sin shall not have dominion over you: for ye are not under the law, but under grace. What then? shall we sin, because we are not under the law, but under grace? God forbid. Know ye not, that to whom ye yield (submit) yourselves servants to obey, his servants ye are to whom ye obey; whether of sin unto death, or of obedience unto righteousness? But God be thanked, that ye were the servants of sin, but ye have obeyed from the heart that form of doctrine which was delivered you. Being then made free from sin, ye became the servants of righteousness. I speak after the manner of men because of the infirmity of your flesh: for as ye have yielded (submitted) your members servants to uncleanness and to iniquity unto iniquity; even so now yield (submit) your members servants to righteousness unto holiness. So, how do I submit? I have to learn to submit and be controlled by the Holy Spirit at different times throughout the day at the point of spiritual impact. 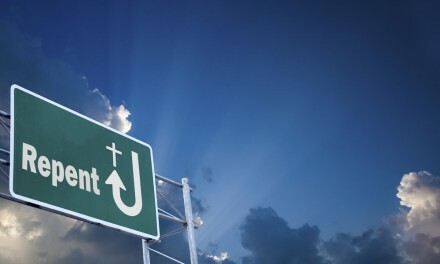 Every time a lust, evil thought, or outside pressure comes up, which I call the point of spiritual impact, “Lord, I want to turn this over to you. Forgive me for this thought or desire and I want to turn from it. I submit myself to you to be controlled and filled by the Holy Spirit.” In the book of Philippians it talks about “Rejoicing in the Lord always.” The only way to rejoice in the Lord always (moment by moment) is to be a Spirit controlled person by submitting to God at the point of impact. Philippians 4:4-9, Rejoice in the Lord alway: and again I say, Rejoice. (5) Let your moderation (self-control) be known unto all men. The Lord is at hand (in your life). (6) Be careful (anxious) for nothing; but in every thing by prayer and supplication with thanksgiving let your requests be made known unto God. (7) And the peace of God, which passeth all understanding, shall keep your hearts and minds through Christ Jesus. (8) Finally, brethren, whatsoever things are true, whatsoever things are honest, whatsoever things are just, whatsoever things are pure, whatsoever things are lovely, whatsoever things are of good report; if there be any virtue, and if there be any praise, think on these things. (9) Those things, which ye have both learned, and received, and heard, and seen in me, do: and the God of peace shall be with you. I want you to notice in verse 6 the phrase “prayer and supplication.” Supplication means to ask for something humbly (submitted). Then I want you to notice in verse 6, thanksgiving. Then notice in verse 8, praise. So, at the point of impact rather than be anxious, Lord I want to turn this over to you, I ask you to forgive me, I want to submit this to you and to be controlled by the Holy Spirit. Since most problems begin in the mind, Lord what do you want me to praise you for and thank you for? Then verse eight comes to play proper Spirit controlled thinking rather than let your mind worry, fret, and think on the wrong things. It must become a daily moment by moment part of your life to be a Spirit controlled person. Hebrews 13:15, By him therefore let us offer the sacrifice of praise to God continually, that is, the fruit of our lips giving thanks to his name. When? Continually! See the word imaginations? It means fantasies. Every person who is rebellion in their life is because they are living in a fantasy world. A place where they allow their minds to run off and fantasize about living in another time, another place, with another woman, another man, being immoral with a boy or girl, man or woman, sports, activities etc.. Many people spend hours in their virtual reality world where they think no one else sees. Let me clue you in God sees! We wrestle not against flesh and blood. Therefore, our weaponry is not carnal (fleshly). However, it is in fact powerful through God for the pulling down of strongholds. (Interesting word). Strongholds where? In the mind. The word strongholds literally means “a heavily fortified containment and is used of a false argument in which a person seeks “shelter” (a safe place) to escape reality.” Ephesians 6:13-18 describes some of the spiritual weaponry God has given for us. When a person is in rebellion to their parents, Biblical authorities, boss, etc. it never fails that they have not controlled their thought life or they do not know how to do so. The essence of the submitted Christian life is to ask God questions. Remember James 4:7 says the devil is involved and the only way to walk in the Spirit is to have a submitted life with God. That is where our power comes from, being submitted moment by moment, at the point of spiritual impact. In the question asking with God, use the: who, what, when, where, how, and why method. Lord who do you want me to witness to today? Lord what do you want me to pray about today? Lord, what can I praise you for today? Questions are submission. Remember to stop, think, turn it over to God, and listen. Always ask God questions. The sadness of the hour in which we live is that many Christians do not have a real relationship with God. Folks, do not think that I have said memorization of Scripture is not good. It is, but by itself will create a self-righteous life. If you memorize it, meditate on it. How does God speak to you through the verses? Also, you have to read your Bible to meditate, but you have to stop to study and listen to the Spirit of God when He wants to show you what He wants for you from God’s Word. Do not just keep on going because you have three or four chapters you must read today. You have to stop and listen! A real relationship requires we spend quality time together. Kim (my wife) is my best friend. She is someone I can talk to and listen to. She is the love of my life. My relationship with the Lord is to be like that as well. We have a booklet on our web site www.hopebiblicalcounselingcenter.com called, How to Have a Daily Time With God. It will show you step by step how to have an intimate, personal, passionate relationship with the Saviour. When you have a real intimate personal, passionate relationship with the Lord, you are focused and rejoicing! When the devil comes along with his outside pressure, you are focused on the Spirit of God speaking to your spirit, and your soul is then controlled by the Spirit of God and so is your body, thus you are Spirit controlled and walking in the Spirit. Once I learned what it was to have a real relationship with God, as a father, I knew I had to teach it to my children. I wanted them to really know the Lord and to be thankful in their lives! When a person learns how to be thankful it changes their demeanor, their actions, and their spirit. Thus they have a right spirit and now they can be teachable and not until then! I discussed it with them about what all this meant. I wanted them to know how to have a real relationship with God. Without a real relationship with God their lives will be a disaster when they leave my house. Many times I would ask my daughters when they were growing up, “What is God speaking to you about?” Their answers were always revealing to me. I did not just hope it would happen. I wanted them to taste of the Lord and see that He was good! We spent time talking about our relationship with God. I would ask them what God was speaking to them to pray about. We talked about it and as they got older they would come with real excitement to tell me what God was speaking to them about or what God had taught them. We would have that excitement and joy together. I believe the principle of Ephesians 6:4 is very important here. And, ye Fathers, provoke not your children to wrath: How would a father provoke his children to wrath? Could it be because he did not teach them to have a real relationship with the Lord? We did not teach them to be thankful people? So they learn in their lives, when the outside pressure comes from Satan, how to respond by being controlled by their soul and respond in the dictates of the flesh. One of those is “wrath”, Galatians 5:19-21. The rest of Ephesians 6:4 says, but bring them up in the nurture and admonition of the Lord. It means training with structure. I say again folks, how can a parent get the heart of their child and train them to have a relationship with the Lord if they are living a self-righteous (living the Christian life in their own power) or unrighteous life and not being a thankful person? It is not going to happen and the end result for the child’s life is the works of the flesh list of Galatians 5:19-21. (Read that list over and meditate on it. Are you or your children in that list?). The kind of life the self-righteous Christian lives is a real grind. It is over and over the same thing – keeping the rules, but not experiencing the power of a real relationship with God. The Christian who lives that way takes on the 19 characteristics (from II Timothy 3:1-5) of the apostate age in which we live. How does it end? 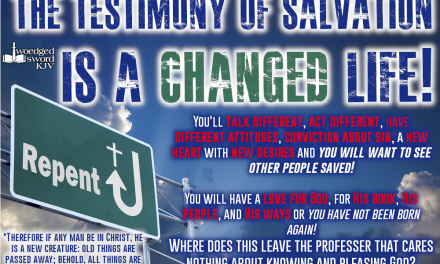 “Having a form of godliness, but denying the power thereof:” What a miserable life and a destructive life! It does not have to be that way. We can have victory through the power of the Spirit of God who indwells us and wants us to have a real relationship with Him. I am firmly convinced that much of the failure in marriage and children growing up to walk with God is not knowing how to be thankful people. Hebrews 13:15-17, By him therefore let us offer the sacrifice of praise to God continually, that is, the fruit of our lips giving thanks to his name. (16) But to do good and to communicate forget not: for with such sacrifices God is well pleased. (17) Obey them that have the rule over you, and submit yourselves: for they watch for your souls, as they that must give account, that they may do it with joy, and not with grief: for that is unprofitable for you. Did you notice that we are to offer praise and thanks continually from our lips in verse 15? Then notice verse 17 about obedience. A non-thankful person will never learn to obey those who the authority over them! Colossians 3:15-17, And let the peace of God rule in your hearts, to the which also ye are called in one body; and be ye thankful. (16) Let the word of Christ dwell in you richly in all wisdom; teaching and admonishing one another in psalms and hymns and spiritual songs, singing with grace in your hearts to the Lord. (17) And whatsoever ye do in word or deed, do all in the name of the Lord Jesus, giving thanks to God and the Father by him. Did you notice in verse 15 to have peace you have to learn to be thankful? You have to learn to be thankful before the word of Christ can dwell in you richly. A word controlled person is a Spirit controlled person. Why? So, your words and deeds will be by a person who gives thanks. Folks, this is huge in our lives and so much missed to day. In this article we have given you the tools of thanksgiving and praise for your life. They are vital to your walk with God. Also, to your marriage and what happens to your children spiritually. I encourage you today to read this article more than once. Realize the importance God places on thanksgiving and praise and implement it in your life to be all you can be for God. Without it the Christian will miserably fail. Just think what it will be like when you can, Rejoice in the Lord alway: and again I say, Rejoice, Philippians 4:4. God wants you to rejoice and have peace! Why not start today by learning to be a thankful person? Dr. Terry L. Coomer is the Pastor of Hope Baptist Church and the Director of Hope Biblical Counseling and Training Center. He has also served as the Publisher of the nation’s fastest growing daily newspaper. 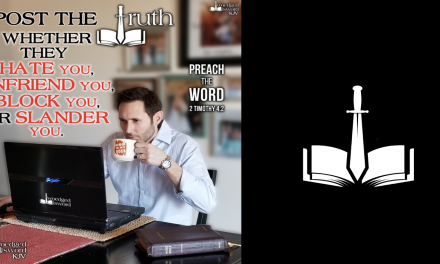 Pastor Coomer holds Bible Conferences in the local church dealing with Biblical Counseling and how to make Biblical long term change in lives. He also teaches how to have a real, intimate, personal, and passionate relationship with God. His Biblical Counseling ministry has helped many people find the Biblical answers to the needs of their lives. To have a meeting at your church or other needs he may be contacted at (501)983-4403, tlcoomer@juno.com. 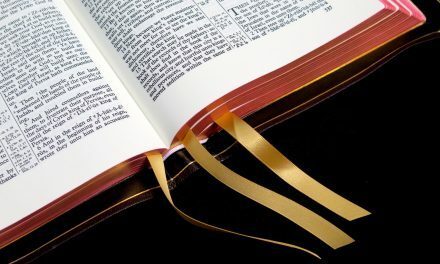 There are many helpful articles and material on our web site to help you change your life at www.hopebiblicalcounselingcenter.com. We serve the God of answers. If you need help finding those answers you may contact us at tlcoomer@juno.com. To be removed from our mailing list send an e-mail to tlcoomer@juno.com.